Wow! 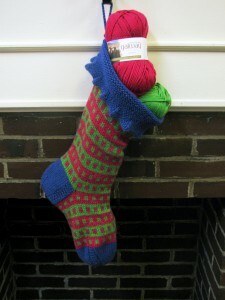 Not only is this season great for knitting, but to create yet another Holiday Stocking for yet another grandbaby! My latest granddaughter Zoey is the recipient. This is the 4th holiday stocking I have made in less than 4 years! Four girls under the age of 4! I know! ….You can guess what holidays will be like when all of my grandgirls come to visit Nonnie and Papa. If you can see the scale of this stocking you will see how I have learned to secretly spoil them every single year. It will take a tank load of treats to fill these! One thing that can be done to this stocking is felt it if you would like it smaller and denser. And Galway is a perfect yarn to do that with. 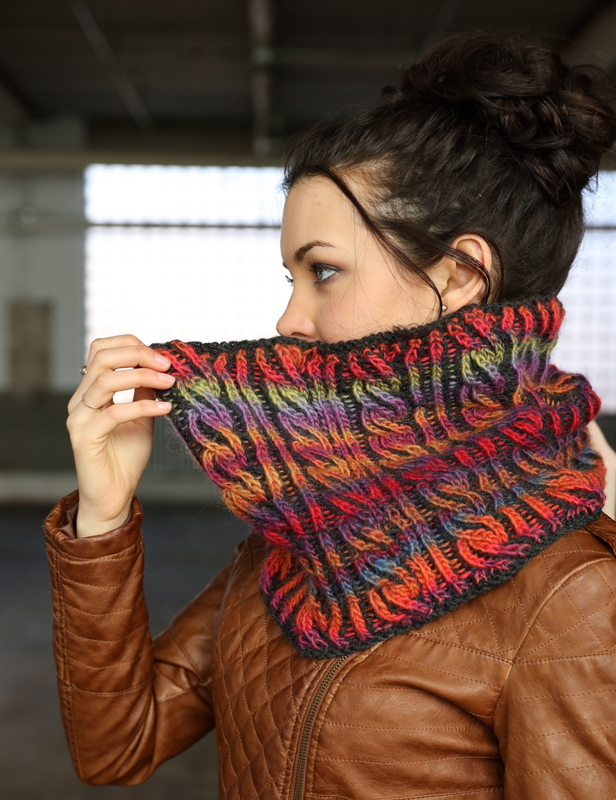 The array of 124 colors in the Galway palette give you an infinite number of possibilities for colorways. With the large scale of this pattern, it could be a good tool to learn (or teach a class) on how to turn a heel, or shape a toe. Way fun! Or if you are “old hat” at socks, make a pot of soup, put your feet up and enjoy the colors emerging. Needles: US size 9, (16”) circular, and size 9 dpn’s, 1 stitch marker. Using Color A and circular needle, cast on 144 sts. Row 2: K4*[Sl2, k1, psso2], k9; repeat from *. (120) sts. Row 3: K5 * P1, K9; repeat from * end k4. Row 4: K3 *[sl2, k1, psso2], k7; repeat from * end k4. (96 sts). Row 6: K2 *[sl2, l1, psso2], k5; repeat from *, end k3. (72 sts). Row 7 & 9: k3 *p1, k5; repeat from *, end k2. Continue in Garter St until piece measures 4” from the points. Purl one row for Folding Row. Continue in Garter until piece measures 6”. Cut color A. With WS facing, join in the round. Stripe # 1: Using color B knit 2 rounds. Next round k2 with B and k2 with C across entire row. Stripe # 2: Using color C, knit 2 rounds. Next round k2 with c and k2 with b across entire row. Repeat for 3 rounds total. Next work 2 rounds with just color C.
Alternate Stripe # 1 and Stripe # 2 for a total of 8 stripes. Cut colors B and C.
With Color A K18 on dpn. Turn and purl 18 sts and then purl an additional 18sts. (36 sts). 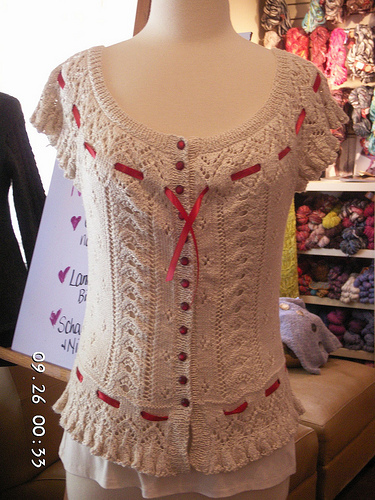 With 2 dpn’s knit 36 sts. Turn (WS row) k5, p26, k5. Repeat these 2 rows until you have 7 garter ridges on RS. Next row: (RS) k13, k2tog, k6, ssk, k13. Next 5 WS rows: K5, purl to last 5 sts, k5. Next row: K12, k2tog, k6, ssk, k12. Continue in this decrease for every RS row by knitting 1 less st at beg and end of each row until you have 26 sts. Then on next RS row K16, ssk, turn. WS row: Sl1, p6, p2tog, turn. RS row: Sl1, k6, ssk, turn. Repeat this until 8 sts remaining. With Color B and circular needle, k4, place marker, k4. Pick up and knit 13 sts along the ridges created for the heel. Pick up 1 at the corner. K36 across the instep that are waiting on the circular needle. Pick up 13 more sts along the other side of the heel, then one more at the corner. K4 to center of the heel. (72 sts). Using Colors B and C return to established Stripe pattern starting with Stripe # 1. 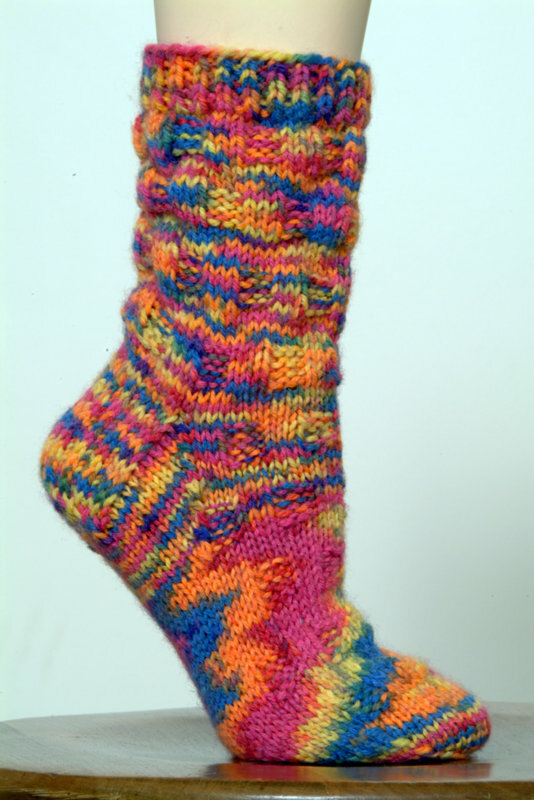 When 5 stripes are completed for the foot, cut colors B and C.
With Color A, knit 18 sts onto each dpn. Needle # 1and 3: knit to last 4 sts, k2tog, p2. Needle 2 and 4: P2, ssk, knit to end of needle. Place a marker on the fabric under Needle # 1 to indicate beginning. Repeat these last 2 rounds until you have 9 Garter Ridges on the Toe. Then you decrease each round without the Knit row in between. Stitch the cuff with RS facing. Weave in all ends. If desired, add bobbles, bells, or tassels at the tips of all the points on the cuff. With Color A and dpn, cast on sts and make an I-cord. [I-Cord directions: Using dpn’s, cast on 3 sts and knit. Without turning work, slide the sts to the other end of the needle, insert the rh needle, knitwise into that st and bring the yarn across the back of the piece and knit as usual. Repeat until desired length.] Leave a tail for attaching. Attach I-Cord to heel side of the cuff. Abbreviations: beg=begin(ning), dpn=double pointed needles, K = knit, p = purl, st st = stockinette s, p2tog = purl 2 sts together, st(s) – stitch(es), psso = pass slipped st over, sl = slip; ssk=slip 2 stitches as if to knit- then knit them together, pm = place marker. 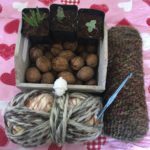 PreviousMoving Right Along…..To The Knitting Corner! I tried this last night and got hung up on row 4. Just couldn’t get the stretch count right. It says Sl1, k1, psso2 but should it really be sl2, k1, psso2? This stocking is adorable and I’d really like to make it! DANG Folks! 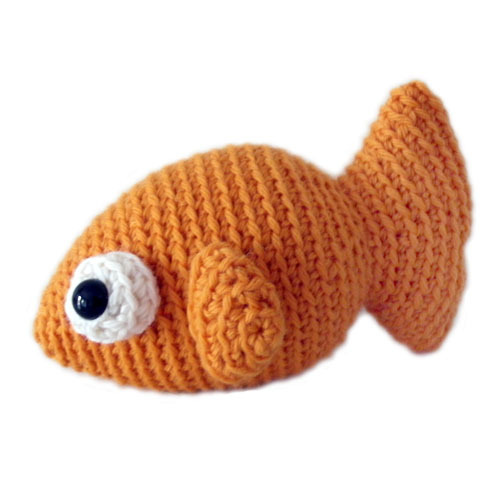 I rushed this pattern out without taking the big fine tooth comb to it. My apologies. You are so right! Is should be Slip 2 sts, knit 1, psso2. WARNING this pattern is very addictive! I have made a few of these for grandbabies. 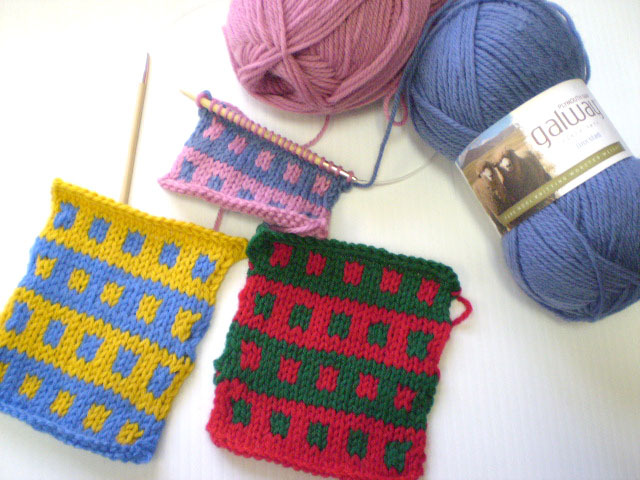 Picking colors is so fun-then knitting fast enough to see how the colors come out! Enjoy this wonderful out come. Such fun! Carol, I hope you saw my correction I put up the day after. My apologies! Hope you are getting lots of holiday knitting done. Wish I could knit in my sleep! Its a great name! My oldest granddaughter Maggie dubbed me that. She is 3 1/2 now. And grandpa is papa. Could have been worse! Isn’t it usually the first grandchild that names the grandparents?